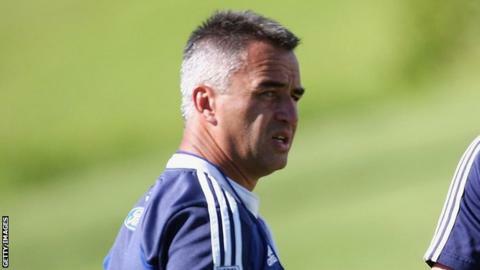 London Wasps have appointed former New Zealand and Wales international Shane Howarth as their new backs coach. The 43-year-old has had spells coaching with the Auckland Blues, New Zealand Maori and the Pacific Islanders. Wasps director of rugby Dai Young said: "He comes strongly recommended from Graham Henry. "We have a similar philosophy on the game and I think we will hugely benefit from his intimate knowledge of both the northern and southern hemisphere." Howarth, a full-back for Sale and Newport during his playing days, won four New Zealand caps in 1994. Under the International Rugby Board rules of the time he went on to play for Wales, making his debut against South Africa in 1998 under then-coach Graham Henry. But two years later Howarth's Test career came to an end when it was discovered he did not have a Welsh grandparent.